October 16, 2017 -- Efforts to curb radiation exposure with dose reduction technology have stepped up in recent years, but a study from Switzerland has revealed another source of excessive radiation dose across hospitals -- overscanning, delegates at the Journées Francophones de Radiologie (JFR 2017) heard today. While actual cancer risk from chest CT is still controversial, radiologists know that radiation dose should be as low as reasonably achievable (ALARA principle). Yet, in chest CT there is a high variance between hospitals in the incidence of overscanning, defined as when scan length is too long for the indicated study, according to Dr. Fides Schwartz, resident radiologist at the University Hospital of Basel, who presented the results of her study at today's session on Lung Imaging. In her presentation today, Dr. Fides Schwartz outlined the principle of the dose tracking software used in her study. The retrospective study aimed to reveal the rate of overscanning in chest CT among five Swiss hospitals that belonged to a regional dose registry, and to estimate the effect of this on radiation dose. 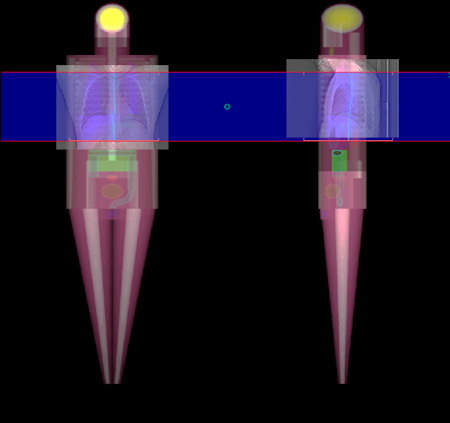 Scout images and dose data were extracted from radiation dose tracking software and organ dose and effective dose estimates were based on Monte Carlo simulations. Schwartz studied 50 consecutive chest CT scans from each hospital that had been acquired between 2014 and 2015. The study revealed stark differences in overscanning among the five hospitals. One hospital registered 66% caudal overscanning when field-of-view was delineated too low. The same hospital registered a 20% rate for combined caudal and cranial direction overscanning -- when scan length was both too high and too low. Cranial overscanning was at 24%. A second hospital showed 28% for cranial, 32% for caudal, and 10% for combined cranial and caudal overscanning while a third registered 30% cranial overscanning, but only 6% and 2% respectively, for caudal and combined overscanning. Conversely, another hospital showed caudal overscanning in only 10% of patients while there was no cranial, or combined cranial and caudal overscanning. A fifth hospital registered 6% for caudal overscanning, 14% for cranial but 0% for combined cranial and caudal overscanning. Combined cranial and caudal overscanning was seen only in a low percentage of patients across four of the five hospitals. Source: 50 chest CT scans reviewed per hospital. Notably the two hospitals that had the lowest overscanning rates used two scout images, an anteroposterior scout and a sagittal scout, to define the borders of the scan range prior to scanning. These hospitals were both academic trauma centers and Schwartz believes their technicians may have benefited from additional training in determining the appropriate scan length. Her study suggests two scout images prior to chest CT are more helpful than a single scout image to determine the proper scan length, and that both radiographers and physicians would benefit from continuous training on defining scan borders. 'Dr. 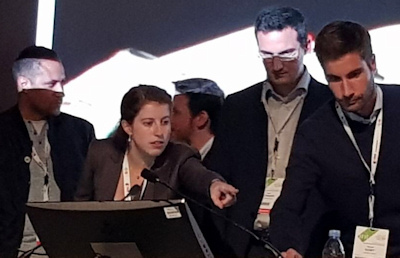 Fides Schwartz pictured here (center, pointing), taking part in a residents and fellows radiology quiz at JFR on Friday with two Swiss colleagues, alongside teams from France and Algeria. The study is important because it sheds light on gaps in training for defining scan borders and scan length across Switzerland. "Technical advances in dose reduction are made suboptimal when scan length is not carefully optimized. Dose monitoring software that can visualize excessive scan length could prove to be a useful training tool for technicians," Schwartz told AuntMinnieEurope.com ahead of the meeting. "Likewise, physicians need to learn how to provide useful feedback to technicians and question why a CT scan covered a more extended length than expected," she noted. That said, there are situations in which a radiographer justifiably may need to extend scan length to answer other clinical questions, according to Schwartz. Radiographers may also opt for a longer scan length when patients experience breath-hold difficulties, to avoid the risk of missing the lower section of the lung during acquisition.